See my video review here, or read on for the full written review! The Guest Bed comes folded up. Folding Twin Guest Bed" -- if you're into long titles!) I also slept on it for three nights to try it out and share my impressions. Here's a quick review & my observations. First Observation: It's an actual Twin-Size mattress! A lot of roll-away or temporary beds are more "cot" sized and are not quite as wide as an actual twin mattress, but this one is. So feel free to use your twin-size sheets, blankets, mattress protectors, etc. They will all work just fine! Also, you could use the frame with a twin-size mattress of your choosing. Say Aunt Esther is coming for a visit, and you want her to have a slightly better bed? You could take your child's mattress and put it on this platform, and have your kid sleep on the 4" mattress that comes with the guest bed. Lots of options. Second Observation: It's rather firm. Maybe a better way of saying that is it doesn't offer lots of pressure point relief. I'm not saying it's horrible, just don't expect it to be as nice as a quality bed if you sleep in one of those every night. That's OK . . . the company doesn't advising using it as your all-night-every-night sleeper. But, in my 3 days of sleeping on it, I would describe it as "fairly good." To help out, I added a 2" thick gel memory foam topper, also from Zinus. That made a big difference! With the topper, I can say it's better than some motel mattresses I've been on. Third Observation: What it's intended for, it does really well. The purpose is to use it for when you have a guest coming and you need a place for them to sleep for a couple days, maybe a week. 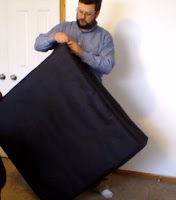 It's not too hard to set up and tear down, and having it's own storage bag is a big plus. (Watch my video for how to set it up . . . there is a flipping over component. It would be fine for most people, but it is heavy enough that a frail person might have difficulty.) I suppose it could be a long-term bed in a pinch, but really, it's purpose is to be a better alternative than a sleeping bag on the floor or spending the night in a recliner. It would be great for those who live in a small home (such as an apartment), going camping/RVing, or if you had a rental home/cabin situation. 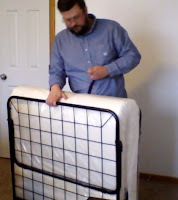 As long as your expectations are for such a use, and not as a luxury every-night-mattress, it's well worth the price. has a zipper and handles. 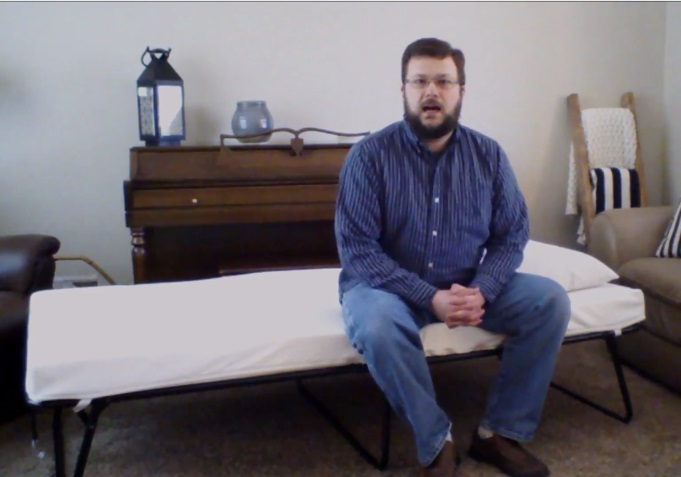 Summary: The Zinus Guest Bed is a great guest bed! This may sound intuitive, and it is! When you're not using it, you can fold it up and put it away in it's own bag (with a zipper) that's about 40 inches by 40 inches, and 11 inches thick -- approximately. It rests on a frame that is a metal grid, not springs, so there is no noise or squeaking. I can recommend it. - Order Direct from Zinus, the manufacturer: Click HERE -- there will be a 10% discount that's applied automatically if you follow this link (you won't see the discount until you get to the cart). - Order from Walmart.com: Click HERE -- on the date I posted this, there was a very small discount if you shipped it site-to-store for pickup in a local Wal-Mart. If you have Amazon Prime, the shipping from Amazon is 2 days, whereas the link from Zinus or Wal-Mart.com is about 5-6 days, at least where I live. Prices, discounts, and conditions vary, so click on the links. Since prices change frequently, I suggest looking around and finding what works best for you. Side view. Supportive enough for a "full size guy!" I'd love to hear your comments and questions! Thanks for reading! I won a gift card from Zinus as part of a "refer-a-friend" promotion, and I used that to buy my Zinus Guest Bed at a significant discount. The above links are affiliate links; please see the disclosure at the bottom of this web page. All opinions are my personal reviews and preferences. Thanks for your consideration.